Our therapeutic treatments offer a sacred place to look deeper into your self and be supported in your personal health journey. The dhyana Center practitioners believe in the client’s ability to change and heal themselves, through education, realistic home remedies and a non judgmental environment. Consider if you have a practitioner preference. See the bios of our supportive community below. We are open 9am-8pm daily and happy to accommodate your immediate need as availability allows. Nourish yourself deeply with this oil-rich massage. Light to medium pressure, warm compresses, and aromatherapy oil provide deep relaxation. Dive into specific areas of pain to find relief. This deeper pressure treatment focuses on releasing specific muscle tension. Get your lymph moving. Includes a Pulse Consultation, steam, hot stones, gua sha and cupping. One of our best treatments for immunity and overall vital functioning of the body. Working with the gua sha tool, this treatment stimulates circulation, breaks down built-up cellulite and scar tissue, and relieves muscle tension. These traditional treatments bring ancient knowledge into a modern application. Add any of these treatments onto another treatment to boost your session. The “Ayurvedic Check-up". This foundational assessment of your emotional and physical wellbeing includes an assessment of the organs, channels, tissues and energetic body and provides you with follow-up nutritional support and at home health remedies. Practitioners use 100% raw silk gloves to exfoliate the skin and support the body's natural removal of toxins. Includes steam, cucumber facial pack and honey milk wash. The rhythmic kneading of the muscles using pouches filled with cooked rice and herbs. Perfect to get tight muscles to relax. A dough dam is created along your spine, holding warm, custom-blended oil so that it can soak deep into your spine. Rejuvenates your central nervous system and softens your spine using warm aromatherapy oils combined for each client’s needs. A Ghee bath eye wash, allowing the eyes to soak in deep nourishment. Supports eyesight, the nervous system and relaxation of the head and neck. Designed to get you out of your brain and into your body using warm oil, compresses and stones. Let go of your stress! Work with all the tools available to address your physical or emotional needs. A deep tissue therapy to help unwind the psoas, the governing muscle of the body where emotions are often held. Cranial Sacral, Gentle Touch Energetics, Emotional Sourcing and Sound Therapy available to address energetic imbalances in and around the body. Sacred sound and light touch energy work to remove karmic patterns. Gain insight into your health, nature, and realizing your life goals through the ancient Vedic approach to astrology. Healing the relationship with food and your body. Pancha Karma is a transformational journey allowing you to unwind patterns of the emotional & physical body. This treatment is beneficial for prevention of disease, detoxification, rejuvenation, physical injuries, pre and post-surgery, auto-immune disorders, nerve disorders, pain management, diabetes, etc. We modify Pancha Karma for pregnancy, cancer support and disabilities. A traditional Ayurvedic multi-day retreat, Pancha Karma is tailored specifically to your individual needs & health objectives. You co-create this life-changing experience with our treatment center staff. Each day is especially created by your practitioner to support your individual needs and health objectives. Please inquire below for more information and pricing and one of our Treatment Center staff will get back to you. Pancha Karma is one the most effective healing modalities in Ayurveda. The dhyana Center considers Pancha Karma the ultimate physical, emotional and mental healing experience for detoxifying the body and strengthening the immune system. We are proud to offer this rare, life-changing and healing experience. these retreats are customized and unique to each individual. Shannon Elsom is a Clinical Program graduate, a NAMA certified Ayurvedic Practitioner, and a Certified Massage Therapist who has over 20 years of hands-on experience working in the eld of rehabilitative massage. One of her passions is helping clients integrate the spirit of Ayurveda through connecting and communicating with their body’s wisdom. As an Intuitive Eating Counselor listed on the national directory, she supports clients struggling with eating disorders, diet mentality, and body image issues. Shannon is grateful to share the gi of Ayurveda and looks forward to being a lifelong student as she continues to grow and deepen her practice. Sonia Cook is a NAMA certified Ayurvedic Practitioner, nationally certified body worker, and yoga instructor trained both in Kundalini and Ayurvedic yoga. She is also the co-creator of Music As Medicine sound healing course, and teaches Intro to Ayurveda classes at the dhyana Center. Sonia has a passion for deepening environmental and social health through helping others connect to themselves and develop a greater sense of self awareness. She uses the foundation of Ayurvedic medicine to help a client achieve greater balance. This can be done with any number of tools from her tool belt. The practices of Ayurvedic medicine are available to all and can meet a client where they are. Saphira El Lyon is a NAMA Certified Ayurvedic Practitioner, a CA Certified Massage Therapist and an Ayurvedic Yoga Certified Teacher. 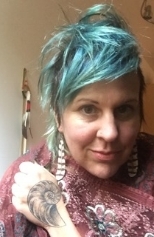 Her background in the Energetic Healing Arts includes Qigong Practitioner Certification, Reiki Master Certification, Theta Healing Certification, Angel Therapy Certifications, and extensive studies in Shamanism, Breathwork, Meditation, Marma Point, Cranial Sacral, Vibrational Light and Sound Therapies. These healing arts offerings are a culmination of Saphira’s life’s work in the the studies of consciousness and spirituality. By bringing spaces for self-awareness, she brings clarity and vision to her clients, allowing profound healing and transformation. Stacey Pfeifer is a NAMA Certified Ayurvedic Practitioner and CA Certified Massage Practitioner with a background in herbalism. These healing arts are her lifelong commitment of work and service in the context of her own spiritual practice. With Stacey, your session becomes a meditation - following the ow of lymph and the tone of your tissues, her bodywork will leave you feeling like melted butter! Stacey brings her heart and mind to each session and loves providing more freedom and ease for her clients. Ren Madrone has a background in social work and psychology. She strongly believes that emotion creates and underlies the physical states we know as disease. After attaining a masters of social work and working extensively in that eld, her learning broadened into western herbalism, shamanic bodywork, reiki, and integrative yoga. Ren works well with those in need of deep work, assisting in the release of the habit patterns/masks that prevent us from being in our own song. Her compassionate and deep work is most o en accompanied by her voice which covers a range of melodic harmony to primordial resonance depending on the particular needs of the client in any moment. Elisabeth Leroy is a NAMA Certified Ayurvedic Practitioner and a CA Licensed Massaged Therapist. She first studied Ayurveda under Dr. Vasant Lad and graduated from the Ayurvedic Institute in 2013. She then studied massage therapy at the NM School of Natural Therapeutics and studied Core Synchronism with Robert Stevens, obtaining her certification in 2016. Elisabeth completed the dhyana Center Clinical Program in 2016. Elisabeth loves to blend Ayurveda, Body Work and Energy Work to customize treatments to the specific needs of her clients. Jenny Rinne is a lover of life and believes in the power of deep connection. She has been teaching yoga and practicing bodywork since 2009. She is a Certified Massage Therapist, Yoga Teacher and NAMA certified Ayurvedic Practitioner. She owns her own practice in Pleasant Hill, teaching workshops, giving clinics, and providing bodywork and other wellness services. One of her favorite areas of wellness is facilitating a space of stillness through meditation whether it’s one-on-one or in a group. Akiva Satnarayan is a Master Numerologist and intuitive healer, focusing his consultations on creating a favorable framework for one’s purpose and destiny. Using cosmic timing by understanding one’s numeric chart and code will shift challenge into opportunity. Akiva has worked for more than fifteen years as a counselor and coach, providing clients with a framework for fulfillment in career, money, and relationships. He is certified in both tantric and kabbalistic numerology as well as in archetypal astrology. Dhyana Bohnet is an Ayurvedic Practitioner who has over 30 years of experience in the field of holistic bodywork and energy medicine, nutrition and wellness counseling and astrology. More recently, she has finely tuned herself to the path of service in the field of Jyotish astrology. She is a NAMA certified Ayurvedic Practitioner, consultant, and teacher, serving at the dhyana Center, the Forestville Wellness Center, and her private practice in Sonoma County, Ca. Dhyana honors each person she works with for their unique life path and healing journey. Dhyana is also an avid practitioner and teacher of medical qigong, as well as hatha yoga, nada yoga and the Dance of Shiva. Rae Rodriguez is a bodyworker, herbalist, yoga instructor, and artist. At the dhyana Center, she holds many roles, including manager of Medicine Making. As a practitioner, she is passionate about supporting the healing of others through integrative bodywork. With a strong belief that death and dying are sacred, Rae is diving into her studies in the field of hospice and palliative care. Whether the client is supported with plant medicine, bodywork or planning the logistics around home vigil, Rae’s intention is to support the death grief process specifically for the individual’s needs for comfort, connection, healing, and ease. Kelley Lake weaves respect for life’s potential, five elements theory, and knowledge of the mechanisms of the human body into her wellness consultation and bodywork to encourage your health. Using Ayurvedic assessment techniques and deep listening, she can help you discover your tendencies regarding imbalance and make recommendations for your next steps in your wellness journey. Kelley uses a combination of Swedish, deep tissue, trigger and acupressure point therapy, Reiki, lymphatic massage and Ayurvedic bodywork techniques. She is trained in clinical herbalism, is a NAMA certified Health Counselor and holds a CA Massage Therapist Certification. Maya McNeil’s work is ided by awareness of the intelligent organizing systems housed within the body. Deep tissue techniques and vigorous lymphatic/adhesion work may be incorporated to address various issues such as structural restrictions, depression, inflammation, trauma/holding patterns, insomnia, or poor immune function. Subtle bodywork, sound, plant medicine and reconnective energetics may be incorporated for the very same issues, depending on each person’s needs and process. Maya believes that approaching health from a bodywork basis is a powerful and practical way to find and maintain ones journey, sovereignty, aspirations, and purpose. Susan Sykes (Sooz) is a NAMA certified Ayurvedic Practitioner with 25 years experience in the healing arts. She has a background in Pilates, meditation and massage therapy along with an intuitive approach to assessing ones needs for optimal health. A consultation with Sooz will give you the opportunity to understand your body type (dosha) and how to best support this through lifestyle, nutrition and self-care. Sooz travels the globe creating healing sanctuaries for events and teaching the way of healthy routines and practices. Melissa Pendleton-Rubke is a graduate of the dhyana Center’s Ayurvedic Clinical Program with DeAnna Batdorff and the Ayurvedic Yoga Teacher Training with Tirza Dawn. She is a Certified Massage Therapist through the National Holistic Institute and is a Health Educator. She has studied, experienced and learned from receiving body work in Bali, and northern India. She has studied energy medicine “Reiki” to the Master Level. Melissa understands that Energy is our life force, along with the breath. She integrates Eastern and Western modalities to fit each clients specific needs. As a Ayurvedic Counselor she is able to help clients develop self-care routines unique to the clients specific mind/body.